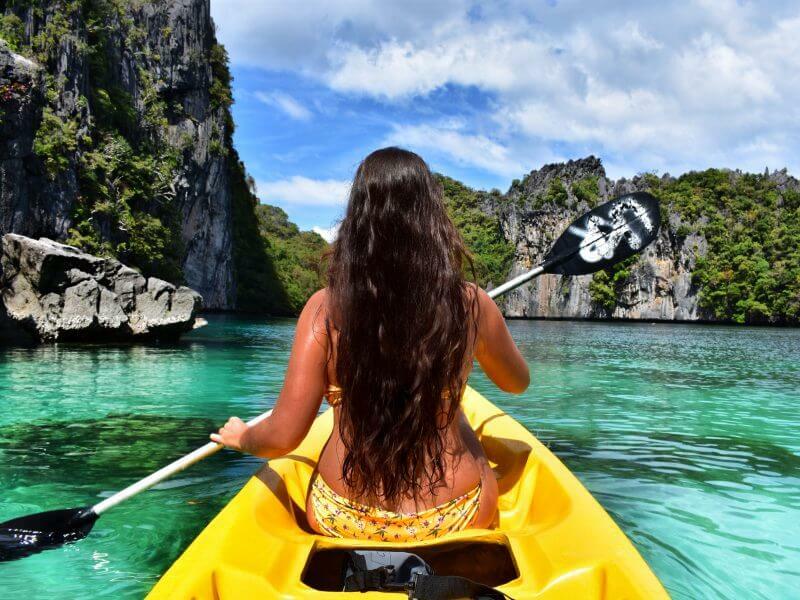 Our Palawan travel experts know where to find the most thrilling adventures to spice up your tropical holiday! If you’re the kind of traveler who craves the adrenaline rush and is happiest when active and out and about, then this adventure-packed tour is definitely for you! 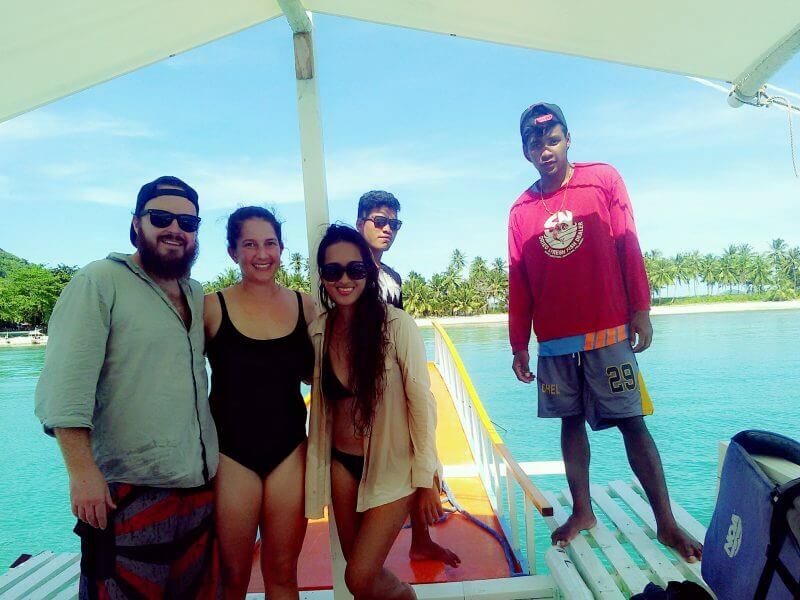 At Palawan Alternative, we can fill up your Palawan Adventure tour with exclusive options, including scuba diving, trekking, remote islands camping, ziplining, cliff-diving, and other heart-racing activities to suit your interests. Just let us know your adventure threshold, and we’ll craft a perfect active and fun-filled trip for you. Note: This is a sample itinerary that can be tweaked to suit your interest. Let us know if you would like to add any other activities you have in mind and we will try our best to make everything possible for your holiday. Please also see ‘Activities’ below. When you are ready, our representative will pick you up at your hotel to start your guided action-packed adventure. You will be rock-climbing or hiking around the highest peak in town, Taraw Cliff, a giant limestone karst overlooking the picturesque Bacuit Bay. Though this is not the Himalayas, be forewarned that you’ll be climbing through sharp rocks, steep, spikey, and jagged paths, with no ropes or equipment at all. Don’t worry as this towering cliff has already been conquered by many adventurers. Depending on your pace and fitness level, this hike usually takes more than an hour to reach the top. Optional: We will pick you up before sunset for the “Food Crawl.” We will visit the top 5 restaurants in El Nido town and taste various Filipino food, usually popular snacks and appetizers. Our representative will fill you in with stories and insights about the local food. You have the choice between taking the usual snorkeling tour or being adventurous enough to try scuba diving. There’s no doubt that while you are in the Philippines scuba diving is one of the most recommended water adventures to experience. Don’t worry if you don’t have the license yet – “Discover Scuba Diving” is just an introductory experience that lets you try scuba diving to see if you like it. This is the first step to become a PADI certified diver. 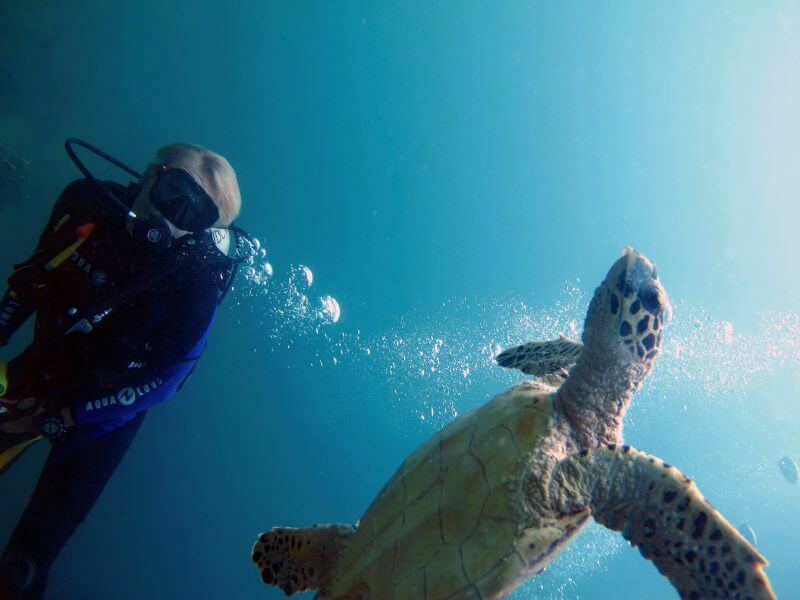 You can find more information from the PADI website – Discover Scuba Diving. Non-divers on the boat can go snorkeling while others are diving. Our representative will pick you up at your hotel at 6:45 am to take you to the main pier. Please be ready so we can board the boat at an earlier time than usual – this is to ensure that we will be one of the first groups to get to the most iconic spots. We want to make sure that you can enjoy the sights around the archipelago without a lot of other tour boats. You are free to stay longer in any places you wish just as long as we can return to the mainland before 5 pm. At the end of the tour, we will transfer you back to your hotel. Our representative will pick you up at your hotel at 8:45 am. 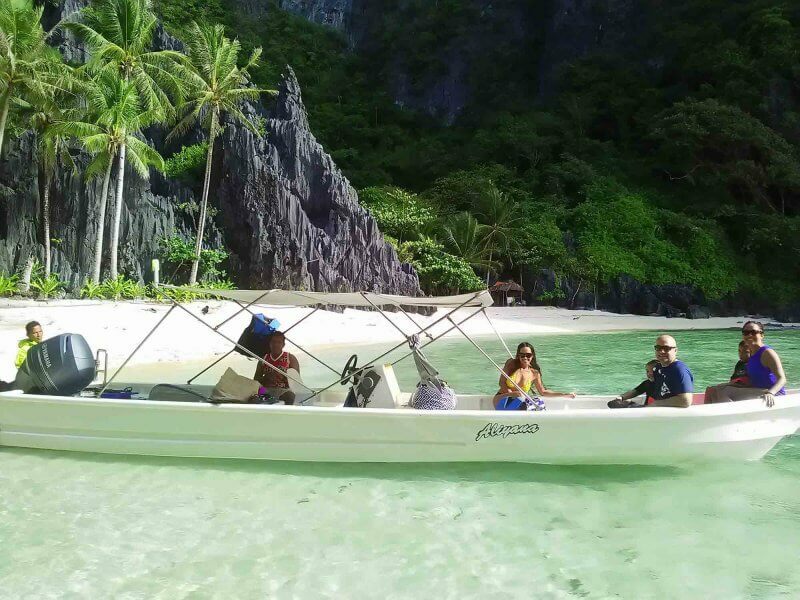 This relaxing beach tour takes you first to Las Cabanas Beach, located 3 km south of El Nido town. Las Cabanas Beach Resort has a botanical garden and a sizable beach with clear waters and a house reef. You’ll be heading up to a steep rickety bamboo staircase in the jungle. Here you’ll get to try the 750-meter zip line with a hectic drop between the coast and nearby island. Enjoy the ride! Swim, relax, and enjoy the panoramic view of the outlying lands. Then we’ll take you to Nacpan beach, a 45-minute to 1-hour drive from Las Cabanas. Nacpan beach is a vast stretch of white sand and clear waters. Here we will have lunch in one of the cottages. You are free to enjoy the rest of the day here in Nacpan – swim, sunbathe, explore the whole beach, hang out in the bars or catch the sunset. This 3-day remote islands camping and expedition takes you around the amazing El Nido archipelago, the Linapacan islands, and Culion. Unplug from the rest of the world and have that much-needed solitude for a few days. This is your opportunity to face ‘the discomfort zone,’ learn from it, and have an authentic and immersive travel experience for once in your life. Our representative will pick you up at your hotel at 6:45 am to take you to the main pier. Begin your journey by hopping on a private speedboat with our local crew. The boat is equipped with all the essentials you will be needing for the whole adventure. The day activities include island-hopping, snorkeling, swimming in the crystalline waters, overnight camping (roughing it out! ), discovering uninhabited islands, stargazing, visiting lagoons and white-sand beaches. This will be your first night camping out on an island. After a fun-filled day, have a proper rest and enjoy the star-filled night sky. Wake up with a gleam in your eye, for a day of adventure lies ahead! Don’t worry as the local expedition leader will continue to guide you on your quest for an ultimate island adventure. There will be tropical treats and freshly-prepared meals throughout this expedition, according to your dietary requirements of course. You can trust our local chef’s expertise to prepare the meals right there and then for you. You know what they say, do as the Romans do. Why not learn how to cook some local dish while you’re here? Fancy fishing? This is your chance to catch something for dinner too! Spend days doing whatever you like best and enjoying the simple pleasures in life. We’ll be heading back to the mainland on your last day, but your adventure does not stop here. You’ll be passing through pristine beaches and exotic islands along the way. Swim in the emerald waters or stare in awe at the beauty that surrounds you. This is your last chance to take it all in and enjoy the rest of the day. We can stop at any time as long as we’re back before five. This is your ultimate tropical holiday, have it your way. At the end of this tour, we hope that you’ll be bringing back with you life-changing perspectives and fun-filled memories. Once in El Nido town, we will transfer you back to your hotel so you can have some proper rest.